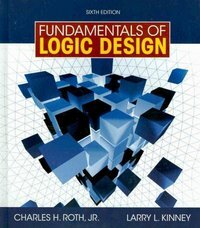 Fundamentals of Logic Design (with Companion CD-ROM) 6 Edition Updated with modern coverage, a streamlined presentation, and an excellent companion CD, this sixth edition achieves yet again an unmatched balance between theory and application. Authors Charles H. Roth, Jr. and Larry L. Kinney carefully present the theory that is necessary for understanding the fundamental concepts of logic design while not overwhelming students with the mathematics of switching theory. Divided into 20 easy-to-grasp study units, the book covers such fundamental concepts as Boolean algebra, logic gates design, flip-flops, and state machines. By combining flip-flops with networks of logic gates, students will learn to design counters, adders, sequence detectors, and simple digital systems. After covering the basics, this text presents modern design techniques using programmable logic devices and the VHDL hardware description language.